a banquet at Gamle logen in Oslo's old town. 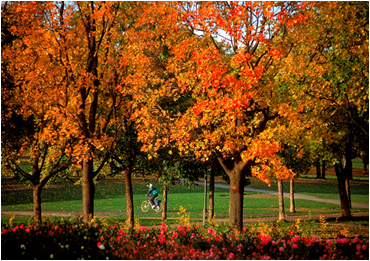 Early October in Oslo is a time of cool, crisp weather that is generally sunny and clear. 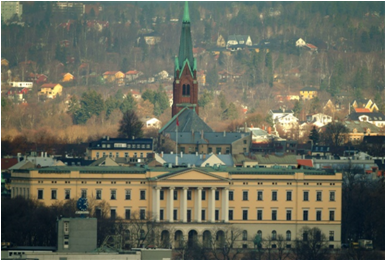 Oslo is located in the center of Scandinavia and is bounded by the fjord and the forested hills, providing stunning scenery. The woods around Oslo are easily accessible by metro, and the city itself offers many outdoor cafes and pedestrian areas near the city center and along the waterfront. Most sites and museums are accessible via short walks or metro rides; see www.visitoslo.com/en. Why not extend your stay and experience the fjords of Norway? A delightful one-day tour is Norway in a Nutshell during which you will travel by railway, boat and bus to see the highlights of southern Norway. Read more about the fjords of Norway or about Norway itself. Last updated Friday, 27-Aug-2010 10:52:41 CEST by models2010@ifi.uio.no.